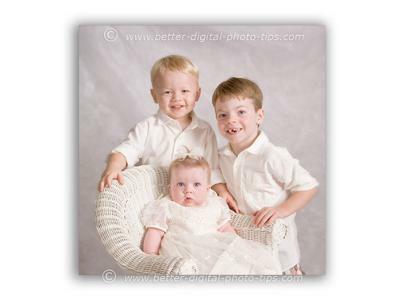 When you have 3 young children to photograph, a chair can be used to support the baby. I had the oldest and tallest child kneel down on the right. The middle child stood behind the chair and the baby was safely secure in the wicker chair. When portrait poses include young babies, it is important to pose everyone in the photograph so their heads are fairly close to each other. This allows you to compose in close so that the baby is not too small in the portrait. Photography poses of children are very dependent on the size of the children and each situation may be different. Baby Portrait Books at Amazon. A good permanent source of ideas for poses can be had by buying a portrait photography book that concentrates on the posing of children. Posing a young child in front of and between two adults makes the three of them occupy a similar space in the portrait but emphasizes the young child a bit more than the adults. It's often a good idea to put smaller individuals in front of large individuals for composition balance. It's also a good idea because proud moms and dads like to show off their children. 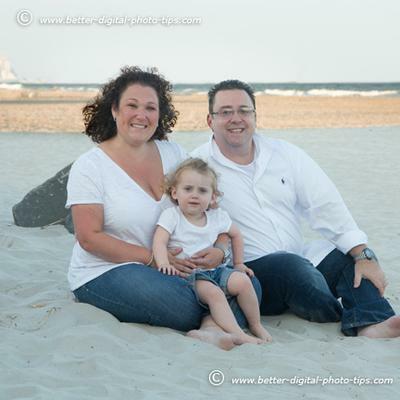 Here was a photography situation where I wanted to use some triangle poses for family portraits of 3 children. 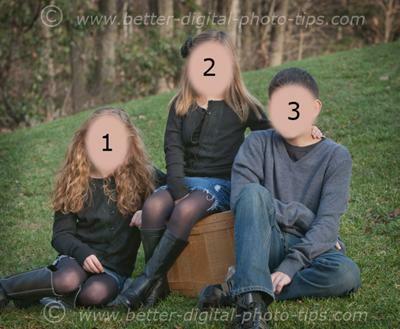 I used a small barrel for the youngest child (head #2) to sit on. This raised her to be the peak of the triangle in this composition. Whenever you are planning what poses you are going to try, remember to consider the height of your subjects' heads and how you may be able to vary them. I instructed my two females (heads #1 and #2) to put their knees together and my male model (head #3) to pose with one leg up, bent at the knee. These are classic examples of male and female posing. Please feel free to leave your own photography tips or comments on this topic.